House sitting Ronya and Rufo in Munich, Germany. Our travels brought us to Munich, Germany because a Munich house sit opportunity presented itself, and while we’d already been to Germany (Dusseldorf and Berlin), we were eager to see Bavaria’s capital. Fortunately, both us and the homeowners agreed that it would be a good match on both ends. So, after a nearly two week adventure in Marrakesh, Morocco we boarded a plane and arrived in Munich, Germany ready to care for two sweet (and playful) cats, Rufo and Ronya. They quickly found our soft spots; Sergio loved playing with them and Shannon was a softy for cuddle action. We settled into a routine of rest and work, but knew we couldn’t waste a perfectly good opportunity to explore a new city! Trusted House Sitters has allowed us to travel the world on a budget, but more importantly given us an opportunity to make new friends and have cute and cuddly companions along the way. Sign up and start your profile to find your next great adventure! We created a comprehensive sightseeing itinerary, researching all the destinations we could find in Munich. So, to possibly make your research on sightseeing in Munich (and other destinations) easier, we’ve kept our maps with all of the information we gathered (accurate at the time of our sightseeing). NOTE: We used this sightseeing map for our personal sightseeing adventures, because of that, some notes may not make perfect sense, and some information could be outdated. Information on this map was valid at the time of creation. All prices are shown in US dollars but are actually Euros (local currency). That being said, feel free to save it to your Google account and use it as a starting point (or modify it accordingly) for planning out your personalized itinerary in Munich, Germany. If you’re familiar with cars (like Sergio) then from the get go you’ll likely know that BMW is short for Bavarian Motor Works. However, if you’re a bit oblivious to car details (like Shannon), the first thing you should know is that BMW is a Bravarian company. Therefore, if you pay attention while out and about, you’ll notice a large percentage of cars on the roads of Munich are of course BMWs. BMW Museum and BMW Welt are in Munich, Germany. Whether you’re a car buff or not, the BMW complex is a place you should certainly consider visiting. The modern design of the building is eye catching (locally known as a silver salad bowl), the concept cars provide a peek into the future, and the ability to get up close and even sit in luxury saloon (sedan) is fun, especially for the younger crowd. With several activity options and places to dine, the BMW complex can easily take half a day to a full day to thoroughly explore. Check the BMW visitors website for visiting information, including prices, hours, and directions. Tip: The BMW complex extends to both sides of Lerchenauer Street and offers a convenient pedestrian bridge to get to the free BMW Welt exhibit and the paid BMW Museum. The BMW complex in Munich, Germany offers a free gallery (BMW Welt) and a paid museum (BMW Museum), both housed in beautiful modern buildings. Across Germany and many other parts of Europe, memorials for the bravery shown and the lives lost during World War II are common. Every memorial and monument is special and holds unique meaning. Weiße Rose Pavement Memorial in Munich, Germany. The non-violent Nazi Party resisters are memorialized through the permanent display of pamphlets set into cobblestone. We found the Weiße Rose Pavement Memorial in Munich, Germany and the story behind it especially powerful. Considered domestic heroes, Hans and Sophie Scholl were siblings who led a group of non-violent resisters against the Nazi Party. This was especially heroic as Munich was a stronghold of the NSDAP (National Socialist German Workers' Party). Weiße Rose (White Rose) was a rebel group of students who attended the prestigious Ludwig Maximilians University in Munich, and distributed pamphlets and left political graffiti throughout Munich and other cities. On February 18th, 1943, members of Weiße Rose were arrested while distributing flyers in front of the university. They were later executed by the Gestapo. Their final act of rebellion is commemorated at the spot where they were arrested, in front of what is now LMU School of Law. As Sophie Scholl is said to have thrown up her remaining leaflets just before her arrest, her action is captured in memory by the memorial of bronze leaflets beautifully laid into the stone walkway. Tip: Learn more about the remarkable efforts of the Nazi resistant group, Weiße Rose and the role they played in the opposition to the Nazis. Weiße Rose Pavement Memorial in Munich, Germany is a creative and touching memorial. Frauenkirche, also known as Münchner Dom (Munich Cathedral), is formally named Dom zu Unserer Lieben Frau (Cathedral of Our Dear Lady) and is a well known landmark of Munich. Built in a Gothic style in the 15th century, the cathedral was heavily damaged by air strikes during World War II, but was rebuilt and renovated to restore it to what it is today. The two towers are a very recognizable architectural part of the church and were designed based on Dome of the Rock in Jerusalem. If you’re day dreaming about what the view from the top would be like, you’re in luck! Visitors can climb to the top of the south tower for views of the city, and on a clear day can even see the Alps! Frauenkirche (aka Münchner Dom or Munich Cathedral) is located in Munich, Germany. Visit at dawn and you may get to see the progression of the lights turning on inside the cathedral! When construction of Frauenkirche began in 1468, it’s said that the architect Jorg von Halspach was in dire need of funding. So, legend goes that in the end, he bargained with the devil. Frauenkirche & the Devil's Footprint (Der Teufels) in Munich, Germany. Head to the back of the cathedral to find the alleged devil’s foot print. The devil (Lucifer) provided the much needed funds and in return he agreed to keep the church in darkness by building it without windows. Upon the completion of the church, the devil inspected the work and at first he was fooled. But then he took a step forward and the columns that had been blocking the windows opened up to reveal a well lit cathedral. The devil was furious and stomped so hard that he left a footprint in the floor that can be seen today. Of course, there are holes in the legend. Like the large front cathedral window that isn’t blocked by columns or the fact that the current foot print doesn’t match the surrounding floor material. Although, if you’re a believer in the tale, then these oddities are explained away by the explanation that an alter once blocked the front window and the reconstruction efforts caused a change of flooring. However, if you’re a skeptic, its an interesting legend to explore while in Munich. What do you think? Tip: During our visit the south tower was closed due to construction. Before visiting, check the website for up to date information. General information on the church, visiting hours, and service hours can be found on the church’s website, however you may need to use the translation feature on your website. In 1923, the Feldherrnhalle monument was the location of an unsuccessful push for power by Hitler, where 16 Nazis were killed. When Hitler reached power in 1933, the Mahnmal der Bewegung Monument was erected to memorialize the Nazis’ that had been killed there. Viscardigasse and Shirkers' Alley in Munich, Germany can be found on the pedestrian street Viscardigasse near the cross street Theatinerstr. Declared a national landmark during the Nazi occupation, guards enforced the requirement for passerbys to salute the memorial. Those who opposed the party and refused to salute the memorial found an alternative passage on a near by street (Viscardigasse). Visitors can walk the same path that those who daringly opposed the Nazis did. Today Viscardigasse is preserved as a pedestrian only alley which has become known as Drueckebergergasse (translating to Deserters Alley or Shirker’s Alley). The path is marked in memory by the subtle but artistic and heartfelt path of golden stones laid among the cobblestone street. Viscardigasse and Shirkers' Alley in Munich, Germany is now a thoughtful and touching remembrance to those who refused to salute the Nazi soldiers. Marienplatz, the main public square of Munich since 1158, is where Rathaus (City Hall) is located. 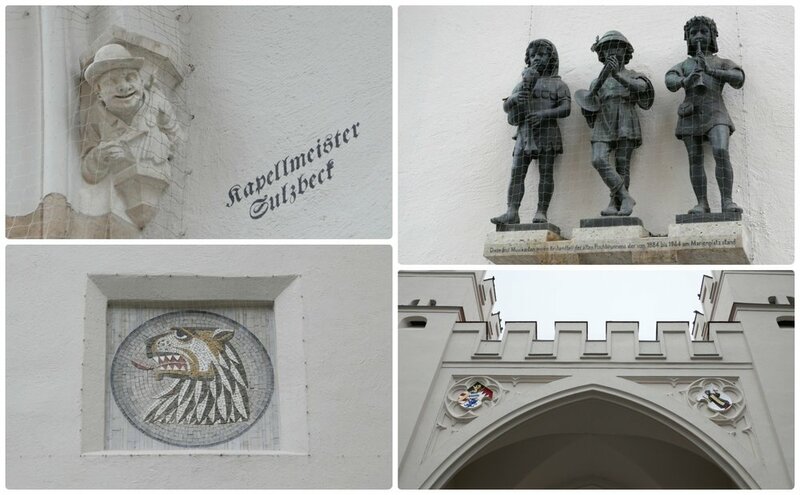 The architecture of Rathaus is beautiful, so when visiting be sure to take extra time to see all of the magnificent detail and sculptures that are a part of Rathuas’ exterior (like Wurmeck the Dragon on the western corner of the building). Rauthaus in Marienplatz, Munich, Germany. The detail on the building is exquisite, particularly Wurmeck the Dragon! What attracts most visitors to Marienplatz is the large amazing clock that comes to life twice a day. Glockenspiel was completed in 1907 and has 43 bells and 32 figures. At 11 am and noon, plus an additional show at 5 pm during March through October, the clock comes to life for a 15 minute show. Glockenspiel can be seen in Marenplatz on the Rauthaus building, located in city center Munich, Germany. The top portion of the clock re-enacts the two week party of the marriage of Bavarian Duke Wilhem V in 1568. The highlight of the celebration was the joust that took place within Marienplatz, shown with Bavaria in blue triumphing over Lonthingren in red. The bottom portion of the clock is a show of the Schäfflerstanz, a traditional dance that legend recounts as being started by the barrel makers (coopers) to commemorate the ending of the plague. The show concludes with three chirps from a golden bird. 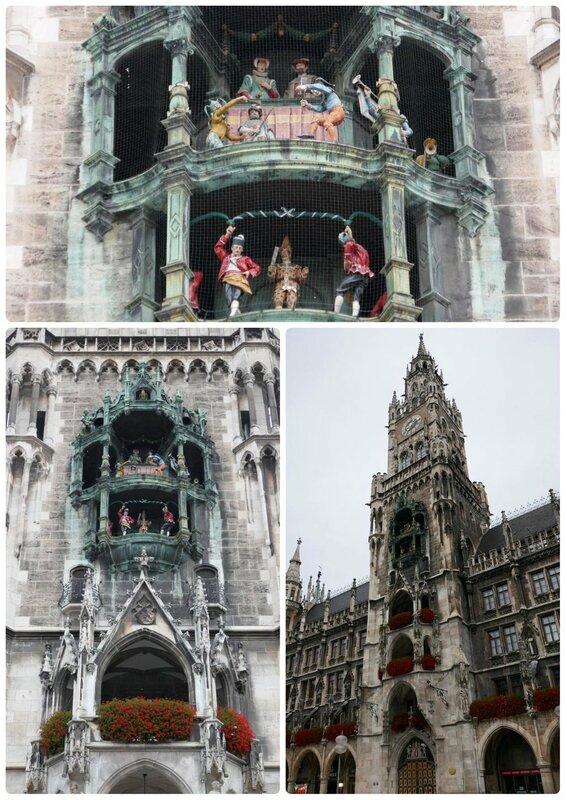 If you can’t visit Rathaus-Glockenspiel during the day, don’t despair, you can still catch a mini-show at 9 pm. During the late show you’ll see that on one side of the clock the Angel of Peace blesses Münchner Kindl (a child monk on the city’s coat of arms) and on the other the night watchman sounds the city curfew by horn. To keep the plague away, the traditional Schäfflerstanz dance is reenacted every seven years, with one happening in February 2019, and another in 2026 (and so on). For an extra special memory of Munich, plan you trip during one of those upcoming times! To get a better view of the clock and the show, head up to the third or fourth floor of the Hugendubel bookstore across the square. Marienplatz is in city center Munich, Germany. Possibly one of the more interesting churches we’ve visited in Europe, the Asamkirche (Asam’s Church) has a unique origin story. Actually named the Church of St. Johann Nepomuk, it has earned it’s name of Asamkirche because of the two brothers who designed it, Cosmas Damian Asam and Egid Quirin Asam. The brothers lived in a private residence next to the church where they designed and oversaw the construction (between 1733 and 1746) not as a public place of worship, but as their own private reverence to their god. The small church, only 20 by 8 meters (65 by 26 feet) was later converted to a public place of worship and the opulent design was shared with the community. The church is one of the most amazing examples of Baroque style and therefore full of many mosaics, murals, sculptures, and various art pieces, that you may have trouble focusing on just one area! For us, what captured our attention was a small art piece located at the entrance of the church (right side). A gold sculpture depicts death as a skeleton cutting the thread of life from a human soul, reminding visitors of their own mortality. Asam's Church (Asamkirche) in Munich, Germany has something ornate to see almost everywhere you look. In particular, don’t miss the unique sculpture of death cutting the string of life. Munich is known for beer, so a brewery is a must on any sightseeing itinerary. The world famous Hofbräuhaus München is located in city center Munich and, with many dining rooms, you’ll have no problem finding a place to sit and enjoy a beer stein! And don’t worry about what time you arrive! We arrived in the morning hours, and even then, there were plenty of visitors enjoying a snack and a pint of beer. History has it that in the 16th century, Duke Wilhelm commissioned Hofbräuhaus to end the import of beer from Lower Saxony and instead supply the court of Wittelsbachs with locally brewed beer. Not only is the beer famous, but the dining halls are ornately decorated with must see ceilings! Hofbräuhaus München Brewery in Munich, Germany is a must see if you want to experience the Bavarian Brewery history that Munich is famous for! The Maximilianeum was built in 1857 for the Maximilianeum Foundation, a foundation to support gifted students. 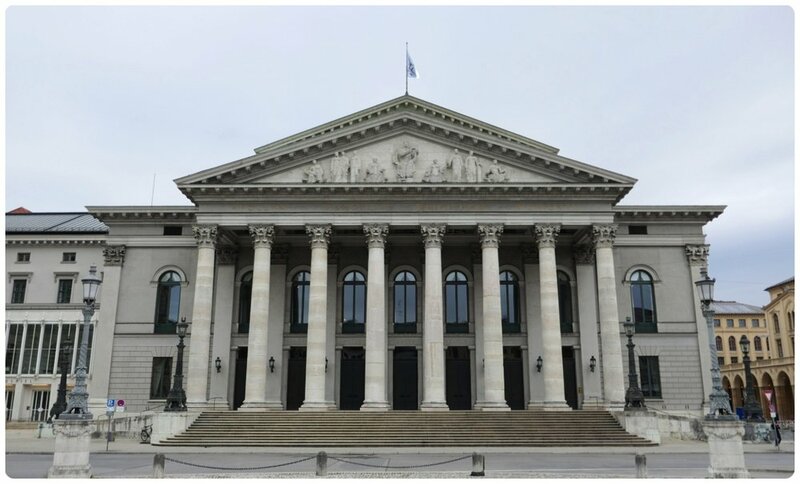 In addition, since 1949 it’s also been home to the Bavarian Landtag (State Parliament). The building itself was repaired after damage from World War II and has been added on to several times (1958, 1964, and 2012). Whether you visit during the day or after nightfall, it’s a beautiful sight indeed! Not only is the Bavarian National Museum one of the largest art museums in Germany, but it’s the perfect place to visit if you want to dive into Bavarian culture. The museum sets a high goal for itself. They achieve this goal with the two permanent collections, the art historical collection and the folklore collection. 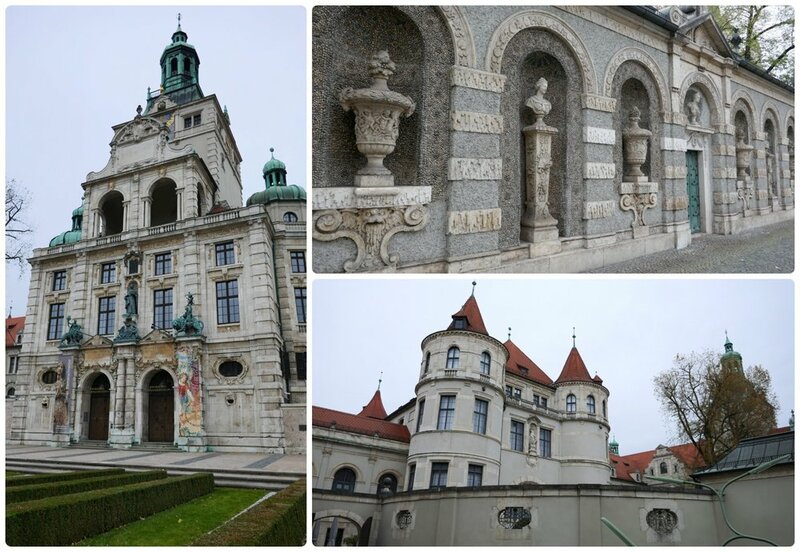 Before visiting, be sure to check the Bavarian National Museum website for current visitor information. Bavarian National Museum (Bayerisches Nationalmuseum) in Munich, Germany. Englischer Garten (English Garden) is a central park in Munich located alongside Isar River. It’s a popular destination for relaxing, as it offers many amenities. Tip: Surfing at Eisbachwelle is for experienced surfers only. Be mindful of the posted sign that reads “Due to the forceful current, the wave is suitable for skilled and experienced surfers only.” If you aren’t joining the surfers in the water (who are here year around, no matter the weather), a great viewpoint is from the bridge above. English Garden (Englischer Garten) in Munich, Germany is a huge central park with activities for just about everyone! The sights don’t stop there. Our sightseeing map is filled with must see places and we of course encountered things along the way that we didn’t expect. Here’s even more what we consider to be the bests of Munich, Germany! Angel of Peace Monument (Friedensengel) in Munich, Germany. Olympiapark: Olympic Tower & Olympic Walk of Stars in Munich, Germany. Visitor and exhibit information can be found on the Museum Brandhorst website. 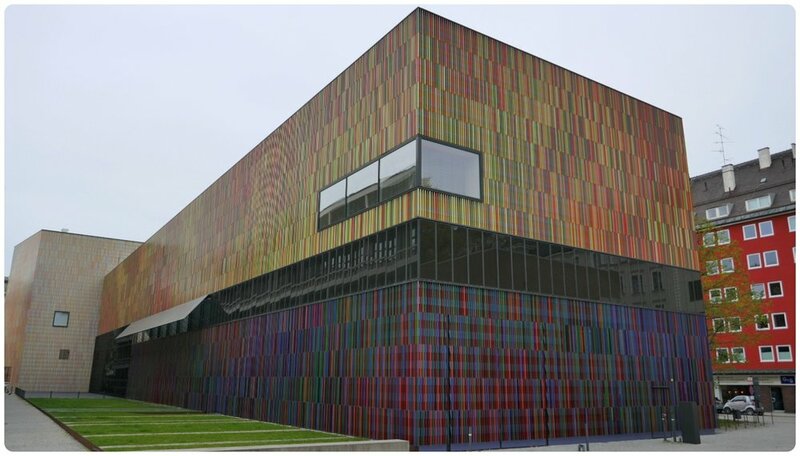 Museum Brandhorst in Munich, Germany is a modern art museum. Visitor and exhibit information can be found on the Pinakothek der Moderne website. Pinakothek der Moderne (Modern Art) in Munich, Germany. Karlstor (Karl’s Gate) is a remaining portion of Munich, Germany’s medieval fortification wall. Don’t miss the up-close detail of Karlstor (Karl’s Gate), which is a remaining portion of Munich, Germany’s medieval fortification wall. Opera House National Theater (Bayerisches Nationaltheater) in Munich, Germany. Siegestor is Munich, Germany’s triple arched Triumphal Arch. When visiting, find this display of murals in the walking tunnel beneath the Angel of Peace (Friedensengel). For a great display of street art (murals), be sure to check out the tunnels that run under the Angel of Peace (Friedensengel) in Munich, Germany. Be sure to walk the entire length of the tunnels under the Angel of Peace (Friedensengel) in Munich, Germany to see all of the murals. Visitor and exhibit information can be found on the Deutsches Museum website. Science and Technology Museum (Deutsches Museum) in Munich, Germany. Odeon Square (Odeonplatz) in Munich, Germany is the plaza where visitors can see Theatine Church of St. Cajetan (Theatinerkirche) and the Feldherrnhalle Monument. The interior and exterior of Theatine Church of St. Cajetan (Theatinerkirche) in Odeon Square (Odenplatz), Munich, Germany. Munich, Germany, a city full of history and wonderful monuments and memorials was a wonderful place to end our one-year continual long-term travel adventure abroad. We initially set out with the goal to travel across Europe, but ‘life’ had a different plan and instead we were fortunate to see parts of Asia (Istanbul, Turkey), and Africa (Cairo, Egypt and Marrakesh, Morocco). Stay tuned, because we suspect that our one-year travel adventure may instead turn into a way of life. We find ourselves agreeing that long-term travel, full time house sitting, and a digital nomad lifestyle suits us well. Stay tuned as we continue to explore the world, one city at time!